Bettina Oberli was born in 1972 in Interlaken/Switzerland. She studied Film & Video at the School of Art and Design Zurich (HGKZ) from 1995 to 2000, graduating with a degree in Directing. She worked in New York as a prop assistant with the actor and director Steve Buscemi on a music video for Lou Reed and with Hal Hartley on his feature film Henry Fool. She also worked as an AD and assistant cinematographer on various advertising films and was a casting assistant for Swiss television. In 2004, she received the International Lake Constance Conference’s Subsidiary Award. After several award-winning short films, her first feature-length film Im Nordwind (2004) celebrated its premiere in the same year at the San Sebastian Film Festival. The film received the Zurich Film Award, the NDR Director’s Award in Schwerin and was nominated for the Swiss Film Award for Best Film. 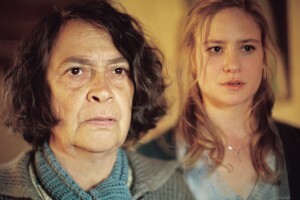 Her second feature film Late Bloomers (Die Herbstzeitlosen, 2006), about four high-spirited, fun-loving retired women who bring chaos to a sleepy village, became the biggest box office success of the year in Switzerland and was also a surprise number one audience favorite in Germany.